The monks who had gathered were delighted to hear these words from the Prince. Bharadwaja told him, "Son! Do not grieve any more. The moment your eyes fall on the Lotus Feet of Rama the burden of grief which torments you now is certain to disintegrate and disappear." The ascetics too consoled and comforted him in various ways. Meanwhile, the Great Sage Bharadwaja beckoned a pupil and directed him to bring roots, tubers and fruits to be placed before Bharatha and Satrughna. He also ordered his pupil to arrange for the supply of food to the aides, the ministers and courtiers, and the citizens of Ayodhya, all of whom had borne uncomplainingly many a hardship on the way in their eagerness to have the Darsan of Rama, and who were afflicted in mind by the agony of separation from their beloved Lord. Complying with that order most reverentially, the pupil quickly offered plentiful repast to every one who had come as guests. For the Princes, Bharatha and Satrughna, their Families, the Ministers and Courtiers, the Pundits and the Brahmins, hospitality was arranged on an elaborate festive scale. Everything was produced plentifully and perfectly, through the ascetic's mysterious will-power itself. Bharatha was filled with wonder. But it must be said that not only the two brothers, but the entire gathering from Ayodhya looked upon the pomp and profusion as mere trash! They were not charmed in the least. The scents, the bouquets of fragrant flowers, the juicy fruits and the attractive tasty dishes struck them with awe. The two resplendent seats specially set up for Bharatha and Satrughna defied all description. When all was ready, the Sage invited every one inside the specially erected Hall, where they were to partake of the banquet. They entered that marvel of beauty. The Royal Preceptor and his consort were led to high seats reserved for them. The queens too entered the place, covered and cordoned off for their sake, and, bending under the weight of sorrow, they too complied with the command of the Sage. At this time, the bright-faced disciples of the Sage brought in the brothers, Bharatha and Satrughna, with all due honour, in accordance with the practice of that renowned Hermitage. The young ascetics stood on both sides of the passage, waving yak-tail whisks and reciting scriptural hymns. They approached the magnificent seats set for them but, as soon as they came near, they bowed their heads and fell on the floor, in respectful obeisance. They took the whisks from the hands of the pupils, and started waving them reverentially, standing one on each side of the Lion Thrones! They were adoring the thrones, instead of sitting in them! All present were surprised at this gesture, this homage offered to the empty Thrones. When the Sage invited them to occupy the Thrones, Bharatha and Satrughna fell at his feet and implored, "Master! These Thrones belong to Sita and Rama, and not to us. We have no right for them. In this holy hermitage, those two alone, Goddess Lakshmi and Narayana, have the title to sit on Lion Thrones. We are their servants. Permit us to serve them thus". At this, the ascetics and the entire assembly were thrilled with joyous appreciation. They extolled among themselves the immense depth of the devotion that the brothers had for Rama. Tears of joy flowed from their eyes. The monks were astounded at their faith and its steadfastness. The brothers offered the elaborate fare that was brought as food to the Thrones picturing in their minds the charming figures of Sita and Rama, occupying them; a little while after, they broke off small particles from the offered dishes and placing them adoringly on their eyelids, they ate them as sacramental food. The elders, ministers, aides and the residents of Ayodhya craved pardon from the Sage Bharadwaja for not partaking of the food, since, as they said, they could not relish any food, overwhelmed as they were by the agony of separation from Rama. They refused to eat, for, they felt that the Darsan of Rama alone could give them the sense of contentment. That was the nectarine feast they yearned for. They were plunged in a gloom as deep as the standard of the Sage's hospitality was high. They said they were too engrossed in their anxiety for the sight of Rama to entertain the idea of food. The sage had finally to accede to their wish to be left alone; he could not prevail upon them to sit down at the feast. Every one got ready to start for the forest, even as early as the first intimations of dawn. They prostrated before the Sage, secured his blessings and his permission before they left the hermitage. While the servants walked in advance showing them the way, the palanquins and chariots followed immediately after. Bharatha walked behind, with his hand on the shoulder of the Chieftain of the Nishadas, Guha. He appeared as the very Personification of Fraternal Love and Devotion. He had no footwear to guard against thorns and pebbles; he had no umbrella over his head to guard him against the scorching sun. He did not allow any one to hold one above him. He did not permit any one to bring him footwear. But, the earth took pity on him and transformed the path he trod, soft and sweet. The wind comforted him, blowing cool and gentle, all through the journey. The Sun drew a cloud between him and itself. They reached the bank of the River Yamuna when evening fell. Throughout the hours of night, boats were seen gathering near the bank in countless numbers. Hence, at daybreak the entire mass of people could ferry over at the same time! Then, they finished their bath, and proceeded forward, after prostrating before the holy river in reverential gratitude. Thenceforward, Bharatha and Satrughna moved on in the robes of recluses, into which they had changed. With them walked the Ministers, the Companions of the Princes, and their aides, carrying the pictures of Sita and Rama in their hearts. While on the march, inhabitants of the villages on the way stood in awe at the strange crowds that passed along; women who where walking towards the river to bring water to their homes placed the pots on the ground and stood stunned, looking on the brothers, without even winking their eyes for one moment. They wondered who they were and concluded that they were the same two brothers, Rama and Lakshmana, passing through that path again, this time, without the Sita they had with them then, but accompanied by the armed forces, the chariots, elephants, horses and foot soldiers. They wondered where Sita could be at that time? They searched for her amidst the moving mass, with eager curiosity; and they shared their disappointment with their friends in sad whispers. "The other day, when we saw Rama and Lakshmana, the brothers were shining with the splendour of physical charm, youth, virtue and intelligence. But, there is some sadness clouding the faces of these two, and so, these might not be those who passed this way that day," argued a woman in the group. Their conversation was overheard by one of the spies of the royal entourage, who reported it to Bharatha. Meanwhile, the women came to know that they were the brothers of Rama, and that they were proceeding to where Rama was, in order to have darsan. At this, one rough-natured woman burst into rage. She exclaimed, "Ruling over the Empire that his father gave him, look at this person, going to have Darsan of his brother Rama, accompanied by the armed forces! Has he no sense of shame?" she asked. Another woman interrupted her at this point. She said, "Sister, don't say so. Our Emperor Dasaratha can never have, from his loins children with hearts so hard. He must be going to Rama with the various units of the armed forces, in order to pray to Rama, and persuade him to return to Ayodhya, and to take him back with Imperial Honours." A third woman declared her acceptance of this interpretation. She said, "Yes, yes. Who knows which snake rests in which hole on the earth? No one can pronounce on the nature of another. Who can judge the feelings and motives that prompt others to action. They may be of very high order, for aught we know. But, Rama is the firm adherent of Truth. He will not return to Ayodhya until the full term of fourteen years is spent in exile, whoever might plead with him and pray to him. This is my belief". She expressed her noble sentiments in this manner. The spies duly reported the conversation of these village women to their Master, Bharatha, and to Satrughna. They were delighted to know that those unsophisticated women from the rural regions had grasped the greatness of Rama to such an amazing extent. Thus, they walked along listening to the people's admiration for the virtues of Rama and for their own humility and fraternal devotion. They were every moment fixing their minds on Rama only. Many Brahmins, ascetics, monks and other holy men were encountered by them as they walked on; they found that all whom they met were engaged in the pleasant task of extolling Rama and his virtues. On seeing them Bharatha prostrated before them and inquired where they were coming from. When the holy men struggled to master the surging waves of ecstasy and at last succeeded in discovering their voices in order to reply, Bharatha watched them in eager expectancy. When they said they were returning after having Darsan of Sita, Rama and Lakshmana, he and his brother fell flat on the ground before them, and rose with tears of joy streaming down their cheeks. They said, "O, how fortunate you are! Tell us, tell us how far are they? Where are they?" They inquired about the health and welfare of those holy men also, and learning from them that they had to continue the journey for some distance more, they decided to spend the night at the place where they were. As soon as dawn broke, they discovered that they were quite near to the Chitrakuta Peak; so, urged on by the yearning to meet Rama, Lakshmana and Sita, the Mother, they continued the journey, with redoubled haste. By about noon, they could hear the murmur of the Mandakini River; they could see clearly the Chitrakuta Peak. The moment their eyes discerned the Peak, the citizens of Ayodhya and the two brothers prostrated on the ground, in reverence. Rising, they walked forward, with renewed vigour. Those who were too exhausted and had despaired of further exertion, suddenly found that they had developed elephantine resources of energy. They walked fast, without paying any attention to their physical condition. Those who bore the palanquins and trudged along on bleeding soles suddenly found reinforcements of strength by cheering Jai, Jai, and reciting the name, Rama, Rama, while they hastened forward. Even before the hour of dawn that day, Rama had risen from sleep; he communicated to Sita that his brother was coming into his consciousness more often than on other days. At this, Sita said, "Lord! You know that I do not get any dreams, any a day. But this night I had a very wonderful dream! I can even say it wasn't really a dream. I dreamt that Bharatha and Satrughna had become frail and weak, as a result of separation from you; I dreamt that, finding it impossible to be in Ayodhya without you for a single moment, they are coming to us, with, not only the people of Ayodhya, but also the Queens Kausalya, Sumitra and Kaikeyi." Tears gathered in her eyes while she was describing the experience. Rama called Lakshmana near and told him, "Brother, you heard, didn't you, the account of Sita's dream? This does not indicate good tidings; for Sita saw all the others and I saw in my dream only father, father alone, with no association or relation with the rest of them. This strikes me as a bad omen. Come! It is best we take a bath." Accordingly, the three of them went to the river for the bath. Just then, birds flew across the sky in flocks; the northern region was darkened by a thick cloud of dust. Many animals and birds were scared into wild haste. Taking note of this unusual occurrence, Lakshmana climbed a tree to find out the reason. He saw an army on the move, with infantry, cavalry, chariotry and elephantry advancing to where they were. He inferred that a king was at their head. He informed Rama accordingly. Rama told him that it was the dream of Sita coming true! He advised that the best course would be to return quickly to the 'thatch' - the Parnasala. Meanwhile, the Bhils, the Kirathas and other tribesmen of the jungle ran into the presence of Rama and gasped out the news that a regular military force was advancing towards the spot and that the chariot of the royal leader of the army had a flag with the sign of the banyan tree upon it. Sita, Rama and Lakshmana were confirmed in their inference that it was no other than Bharatha who was coming towards them. They had no more doubt on that point. By this time, Lakshmana started quaking with anger. When coming to have a darsan of Rama, why bring troops in full strength, he argued. That vile woman, his mother, must have advised him and he seems to have accepted her wicked stratagem, to attack the lonely and unarmed Rama in his jungle retreat and ensure that he does not return and reign, he surmised. Lakshmana was well-nigh consumed by the flames of anger that rose in him. His eyes were reduced to red-hot coals. His words became sharp as sword-thrusts. Rama realized the change that had come over him; he said, "Lakshmana! Forbear! Don't be agitated. Be calm. Bharatha is strong in virtue. His love is immeasurable. He adds luster to the royal line of Ikshvaku, like the lotus to the lake. It is not proper to cast aspersions on one so pure, so immaculate and holy". Thus, describing the exact nature of the motives and mind of Bharatha, Rama succeeded in quietening Lakshmana's upsurge of anger. Very soon, Bharatha himself sent word through some forest-dwellers that he was seeking the Darsan of Rama, along with his brother Satrughna and their attendants and followers. Rama felt glad when this happy news was brought to him. Like lakes in late autumn, his lotus eyes were filled with water. All this happened while Rama, Lakshmana and Sita were returning in haste to the 'thatch' after their hurried bath. Bharatha saw them when they reached the cottage of grass. He was torn by agony. He fell flat on the feet of Rama and sobbed aloud on the ground. Lakshmana saw the anguish Bharatha experienced at the separation from them; he realized that his estimate of intentions was very wrong! He suffered terrible contrition within himself; his head was bent by the weight of sorrow; he shed profuse tears along with Bharatha and Satrughna. Rama raised his brothers from the ground and sought to calm their feelings and quieten their grief. Even while he was so engaged, the Queens, Kausalya, Sumitra and Kaikeyi, and the ministers, the Royal Preceptor Vasistha, the Pundits, the Citizens, the members of the armed forces came near, and were overcome by both grief and joy when they saw Rama. Their sorrow when they looked on Rama in hermits' robes by the side of the lowly hut could not be wiped out by the joy at setting their eyes on their dearly beloved Prince. They wailed and wept, shedding tears of grief and gratitude. The cry, 'Rama! Rama!' that rose from their torn hearts sped over the vast expanse of earth and sky. Rama spoke to them soft and sweet and persuaded them to control their emotions; then, he walked towards the mothers, but could not bear to look on that picture of misfortune and misery. He became aware of the calamity that had befallen, but he soon consoled and comforted himself; he drew Lakshmana near him and told him the fact. Feeling that it would be better that Lakshmana be informed more fully, he requested Sumanthra, the loyal Minister of the Line, to relate to him the details and also the facts regarding administration of Ayodhya. At this, Sumanthra fell down unable to bear the burden of grief. Struggling to rise he said amidst sobs, "Lakshmana! Where can we have Dasaratha hereafter? He was reduced to ashes by the flames of sorrow at being separated from Rama, Sita and you. Ayodhya has become a jungle. Wherever you look, you see only sorrow; whatever you hear, you hear only wailing. Not merely men, even birds and animals cast off their lives when you left. Those who survive are keeping alive in the hope of your return." Hearing this, Lakshmana shed streams of tears. He stood like a stump, unable to reply. Without a word, Lakshmana approached Rama, and told him in a faltering voice, "I could not imagine, even in my dreams, that such a terrible calamity would happen. We could not see our father in his last moments." Rama consoled him, saying that there was no profit in grieving over what has already come to pass. "Physical bodies are as transient as bubbles in water; they are bound to burst and disappear, if not today, at least the day after," he said. He gave expression to many a moral maxim, until both the brothers went to the river, to finish the bath ritually laid down when one hears of the death of those who are near of kin. Meanwhile, Sita went towards her mothers-in-law, and touched their feet in great reverence. She also prostrated before the feet of the wife of the Royal Preceptor. She met the women who had come from Ayodhya and with due consideration put them at ease, by her sweet welcome. When their eyes fell upon Sita, the Queens wept aloud. The womenfolk who had come from Ayodhya saw the plight of their charming young Princess and they were so overcome with sorrow that they too could not desist from wailing. Coming to know that Emperor Dasaratha had left the body, Sita prostrated before the Queens again and again, saying: "Alas! What great misfortune is ours! The Emperor gave up his life because he could not bear separation from us!" Sita felt that the news of Dasaratha's departure was as a thunderbolt on her heart. She and the Queens wept for long at the turn that events had taken. Every one that day could not take either food or drink; they had no mind for either. The entire day and night were spent in sorrow. When the sun rose Vasishta directed Rama to perform the obsequies for the departed father. They were carried out in strict conformity with Sastraic injunctions. Since Sri Rama Himself uttered the mantra sanctifying the waters, "May the holy waters of Ganga, Yamuna, Godavari, Saraswathi, Narmada, Sindhu and Cauvery come into this vessel and sanctify the water therein", the ritual was rendered sacred and eminently fruitful. Thereafter, the Preceptor, the Ministers of the Court, the Queens and the citizens of Ayodhya spent two full days with Rama, Lakshmana and Sita. At the end of the two days, Rama approached the Preceptor, and said, "Master! Those citizens and residents of Ayodhya are suffering very much here, drinking nought else but water and eating nought else but roots and tubers. Looking at Bharatha and Satrughna and also on the Mothers, I feel every moment is as long as an age. It is best you return to the City. You are spending your time here; the Emperor has ascended to heaven. It is not proper that I emphasize the urgency more. Please act, as seems most beneficial." With these words, Rama fell at the feet of Vasishta. Vasishta replied, "Rama! Lord of the Raghu dynasty! Why do you speak thus? You have not realized how happy and contented these people are, since they are fortunate enough to be looking at your charm." When the people heard that Rama had requested them to return, each one of them felt tossed into fear and despair, as a boat caught in a hurricane in midsea. But, when they heard the Sage Vasishta pleading on their behalf, they sailed smooth, as the boat does, when a friendly breeze blows into its sails. 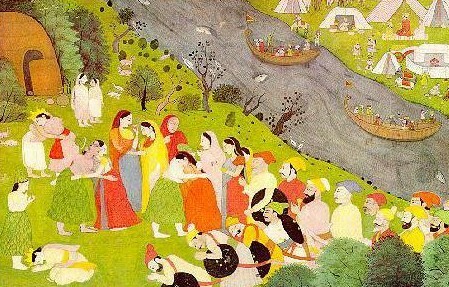 Their minds rejected the thought of returning to Ayodhya, and giving up the fortunate chance of the bath, three times a day, in the Mandakini River, living on the sweet simple meal of fruits, roots and tubers gathered by their own efforts from the forest and more than all, filling their eyes with the pictures of Rama, Sita, and Lakshmana and their ears with the edifying and exquisite words of Rama. Sita was engaged in serving the mothers-in-law, anticipating their needs and over-eager to serve. She consoled and comforted them; she told them how she was spending her days happily in the forest, lacking nothing, and she made them wonder at her fortitude and skill. They were rendered happy at the thought that she was able to derive so much joy under such adverse conditions. They bore their own sorrow with greater ease, when they saw how Sita was braving her own. Bharatha had not a wink of sleep during the night, nor a pang of hunger during the day. While the people were happy, looking on at the face of Rama, Bharatha and Satrughna were filled with misery, while they looked on at that face. They could not bear it any longer; they approached Vasishta and fell at his feet; they prayed to him to persuade Rama to return to Ayodhya, with Sita. They pleaded with him most earnestly expressing their agony in manifold ways. The Preceptor knew only too well the strength of Rama's faith in his ideals, the tenacity with which he stuck to his sense of Truth, and his determination to carry out his father's wishes. But, he was so moved by the sorrow of Bharatha that nothing was left undone to persuade Rama to return. He called Rama to where he was and said, "Rama! Listen to the prayers of Bharatha. Conduct yourself in accordance with the wishes of good men, the interests of the people, the principles of politics and the directives of the Vedas". 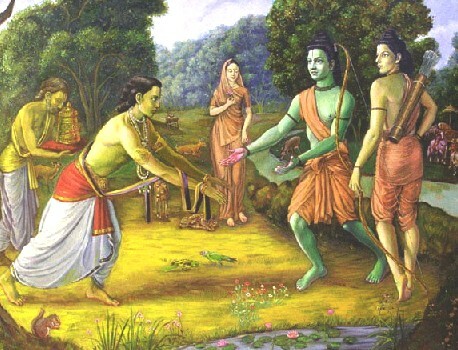 Rama recognized the affection that the Preceptor had towards Bharatha that found expression in these words; he knew that Bharatha would never deviate from the path of righteousness, that he would carry out his directions with full heart and in word, deed and thought and that he would always follow his steps and strive for his welfare and prosperity. He felt happy at this. So, he spoke softly and sweetly a few auspicious sentences, in response to the proposal made by the sage: "Master! You are my witness, my father's feet are my witness. Let me assert this: No one is so dear to me as my brother, Lakshmana. No one has a brother in the world as dear as Bharatha is to me. Those who are attached to the feet of their preceptor are indeed really fortunate; you have such affection and compassion on him; that is his great treasure. He is younger than me, and so, I hesitate to praise him in his presence. My opinion now is that Bharatha should speak out his mind". Saying so, Rama prostrated before Vasishta and took his seat. Vasishta turned towards Bharatha; for he could not reply direct to Rama. He knew that Bharatha was to be 'Ruler'. He said, "Give up all hesitations and doubts. Rama is your elder brother; he has immeasurable compassion. Open your heart to him; tell him all that you have in mind". Hearing these words of the sage, he felt that Vasishta had probed the mind of Rama and that both of them were inclined to favour him and grant his desire. So, he was glad at the turn of events. Bharatha stood motionless before them. Tears flowed from his eye, red and bright like lotus petals. "The revered sage has told Rama all that has to be said. What remains for me to add specially to the appeal he has made on my behalf! I know full well the nature of my Rama. He has no anger against even wrong-doers. He has unbounded affection for me; I cannot deny it. A sense of shame has made me silent while I stand before him. But my affection makes me delighted to look upon him; my eyes do not feel content, however long they fix their gaze on him. God could not tolerate my affection towards Rama; He could not bear to see so much love between brother and brother. So, He designed this distress, devising my mother herself as the instrument to bring it about. I know that it does me no credit or bring me any respect, if I say this. How can I establish my superiority by placing the blame in my own mother? When one proclaims himself innocent, can that statement make him truly so? I am myself hesitating to declare, because of my doubts that my mother is feebleminded or that I am good and intelligent. I am diffident to state so. Can pearls grow in the shells of snails that infest tanks? Why should I blame others for my sorrows? My misfortune is as vast as the Ocean. I know that all this tragedy has happened as a consequence of sins. I have been seeking a way of escaping from my grief, through some means, along any of the four quarters. I see now that there is one way out and only one. My Preceptor is the great sage Vasishta; Sita and Rama are my sovereign Rulers. Hence I am certain all will be well with me. Lord! I do not wish for anything else: Rama! Grant but this one wish of your servant. Rama, Lakshmana, Bharatha and Satrughna are all four the physical progeny of Emperor Dasaratha. So all four are equally bound to obey the commands of their father. The father has equal affection for all the sons. And, there is no limitation or regulation that the commands of the father must be obeyed by this one son or that other son. You have borne the responsibility of obeying his commands, thus far. Now, it is our turn to bear the burden of exile; Sita, Rama and Lakshmana must return to Ayodhya and we two shall be in the forest as exiles until the sentence lapses. Confer on us this boon and bless us." Thus saying, Bharatha fell at the Feet of Rama. Listening to this prayer of Bharatha, Vasishta shed tears of joy. Rama was not taken in by this argument. He said, "Bharatha! I feel that your line of thought is not as valid as you seem to think. It is not correct so to act. Ask me for anything except this." Bharatha replied, "In that case, brother, allow me and my brother to be with you here and serve you, as Lakshmana has been doing. This will then be a wholly satisfying holy life for us." Rama did not accept even this prayer. He said, "Bharatha! For me as well as you, the commands of the father are unbreakable; we have to bow our heads in reverence before them, and carry them out without the least murmur. The most appropriate action for us all is that I should follow the orders issued to me and that you should follow the orders issued to you. let us not spend precious days in such purposeless talk and cause distress to the people who have come such long distances hoping against hope. Return to Ayodhya that has been allotted to you with them and rule them righteously. I shall carry out the task allotted to me and act righteously guarding and fostering the forest realm assigned to me." Neither Bharatha nor any one else could meet this decisive statement of Rama with any counter proposal or argument. They had to accept it as the right path to take.